Gift for a Senior. Frame for Year They Were Born or Married. Here is a truly unique gift for seniors. Choose a handcrafted lasered photo frame that marks the special year your senior was born or was married. These frames are lasered alderwood and measure 3.5" x 5". 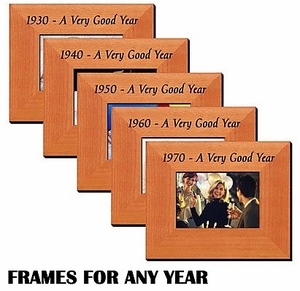 The top of the frame says "(Their Year)- A Very Good Year". Put in a commemorative photo, or nostalgic picture from their past. Available for most years.